House Number 13 - unlucky or lucky for some? According to Zoopla House sale statistics show that a home with a house number 13 is worth less that an identical neighbouring house in the same road by an average of £4000. So you can save around £4000 on the property when you buy it. That can be the cost of a new kitchen or bathroom or go a long way towards painting and refurbishment of a newly bought home. We make thousands of house number signs and plaques every year and have noticed a disproportionate lack of house signs with numbers 13 being ordered. This is probably because a lot of housing developers and local councils have a policy of not registering a house with number 13 in a development or street. In fact 28% of all streets in the UK don't have a house with the number 13. Many property owners ask us if we can make them a plaque with the house number spelled out in wording 'THIRTEEN' instead of having the house number in digits. 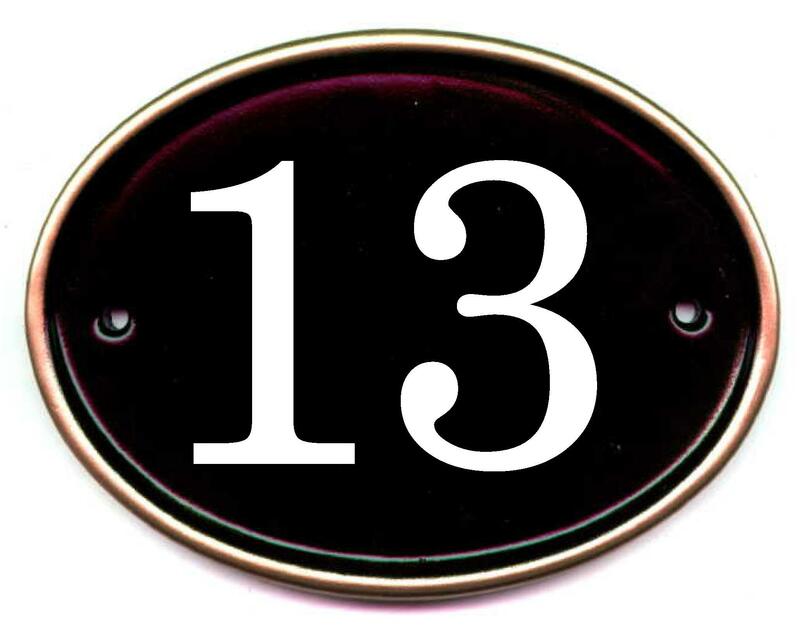 Thirteen seems to be regarded as an unlucky number here in the UK but we think if you can get a home around £4000 cheaper that seems to be lucky.